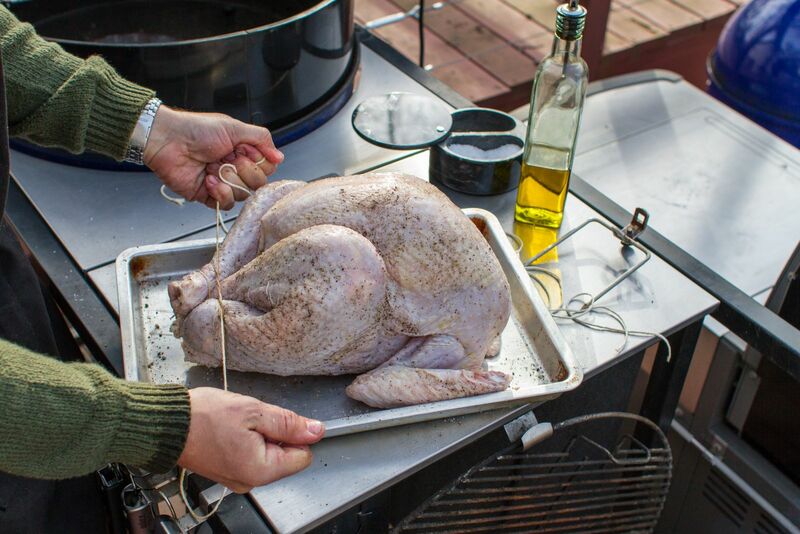 Putting a chicken on the rotisserie is second nature, turkeys, however, do not seem to get as much spinning love. I find this a missed opportunity, as a rotisserie turkey is one of my favorite preparations. 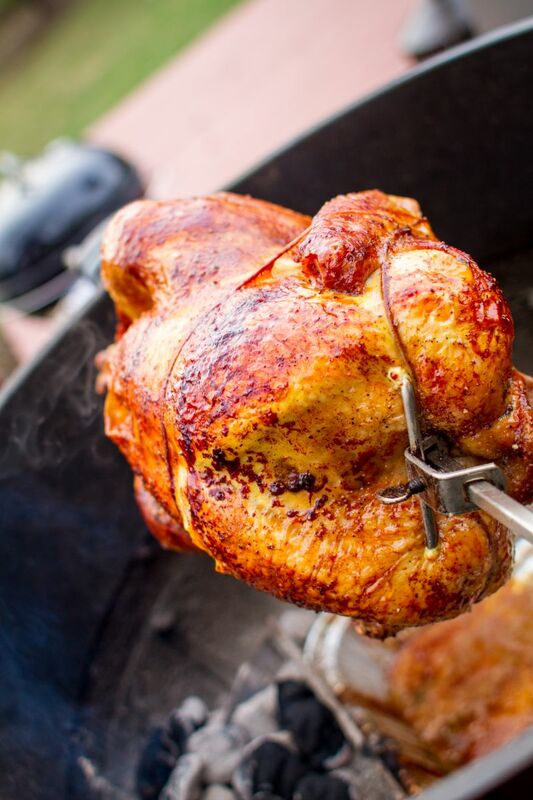 The self basting action of the rotisserie’s spin makes for an almost foolproof dinner. I’ve never had a dry and disappointing turkey. Ever. Maybe the thought of spinning a 14 pound bird seems daunting. Don’t worry, it’s not. As the saying goes, if you can spin a chicken, you can spin a turkey. It’s that easy. While I have grilled rotisserie turkeys on both my Summit Grill Center and Performer, the kettle is my grill of choice. 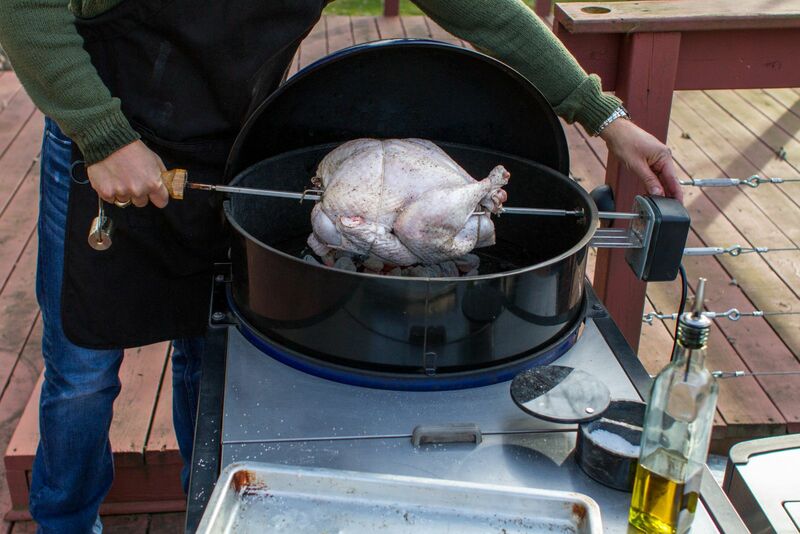 Turkey’s are big, obviously, and the Kettle Rotisserie ring provides more than enough vertical space for such a big piece of poultry. 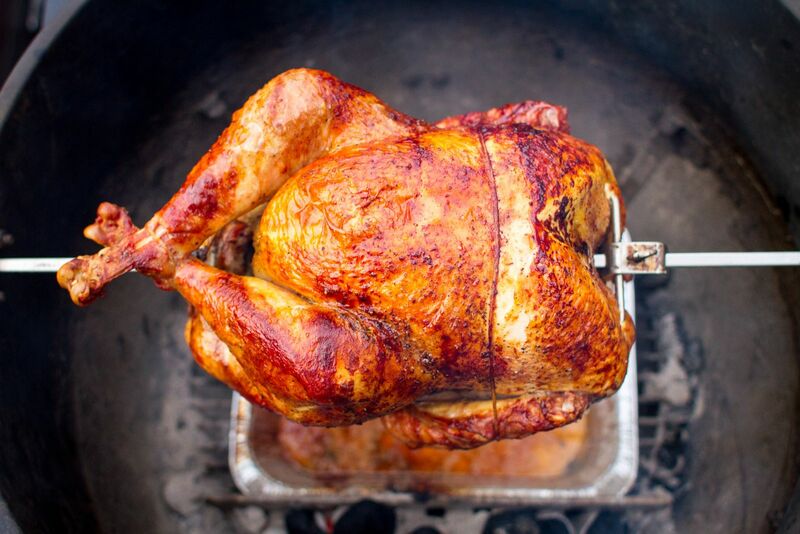 If you are planning to wow your guests at your next holiday gathering, look no further than the rotisserie. There is nothing more tasty than a dizzy turkey. 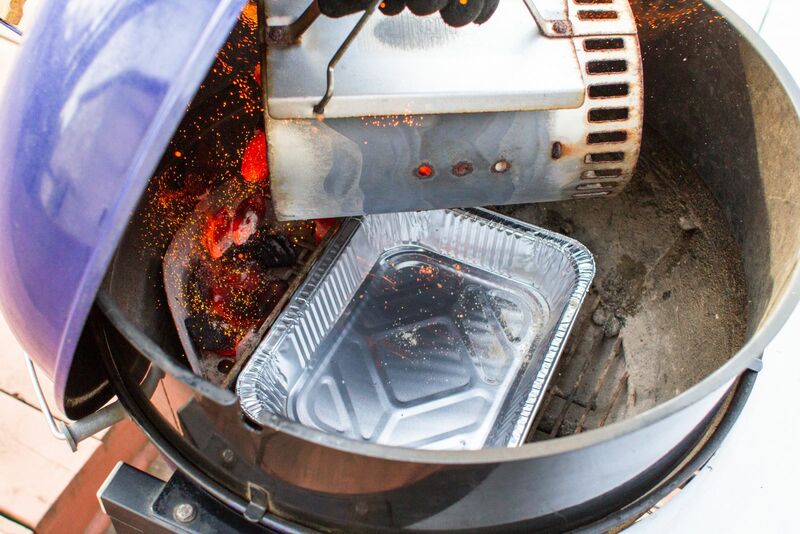 Prepare the grill for indirect medium high heat, 350-400 F.
When using the rotisserie, I mound all of my charcoal to one side of the grill. 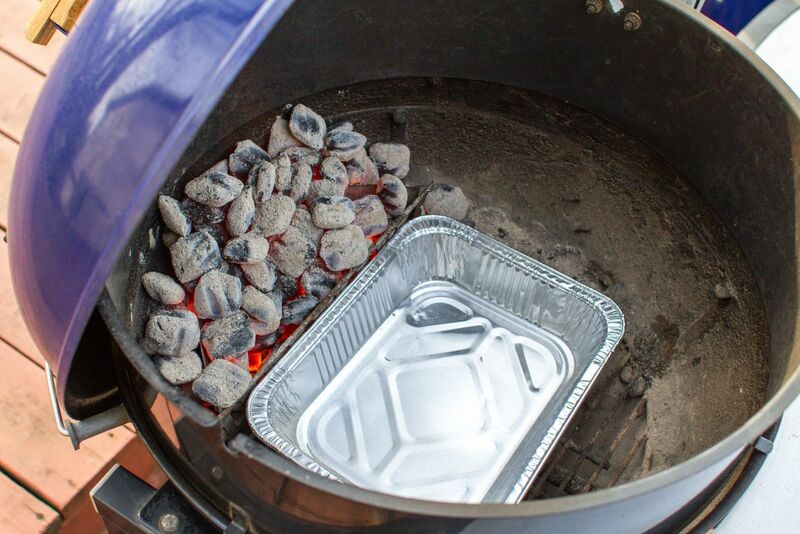 Use a Char-Basket Charcoal Fuel Holder and an aluminum drip pan to help out. With a pair of kitchen shears, remove the wing tips. Wing tips do not have a lot of meat and worse, they are apt to burning if they stick out from the body. They are worth losing. 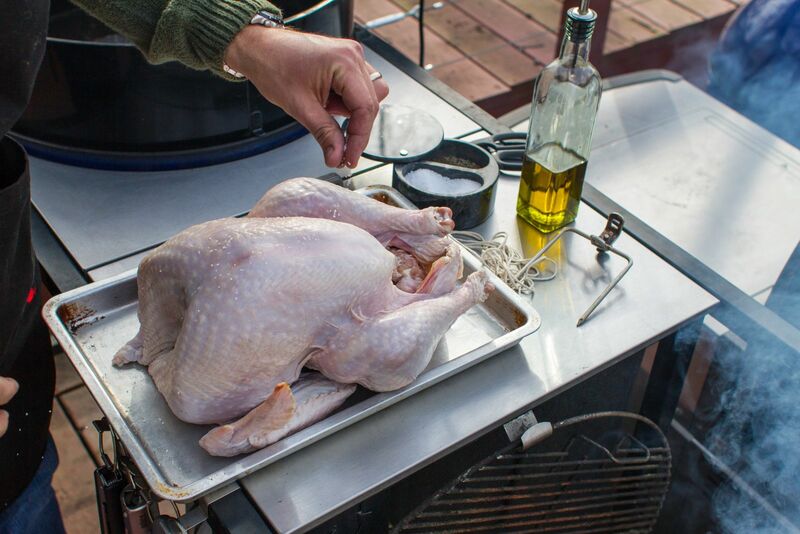 Generously salt and pepper both the inside and outside of the turkey. Lightly rub olive oil all over the skin. 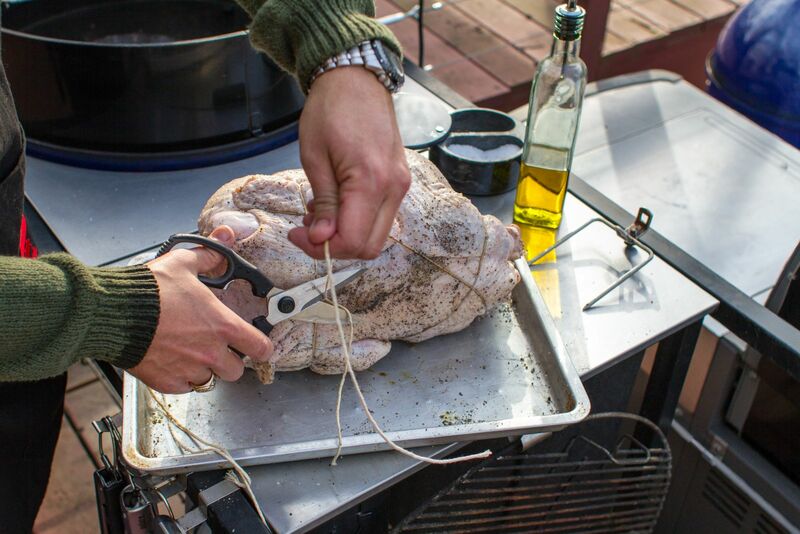 For a rotisserie turkey, I up my trussing. Not only do I tie the legs together and wrap the body, I also add additional trussing up over the wings. The last thing we want after hours of spinning is a wing to break loose and burn. Mount the turkey on the spit. 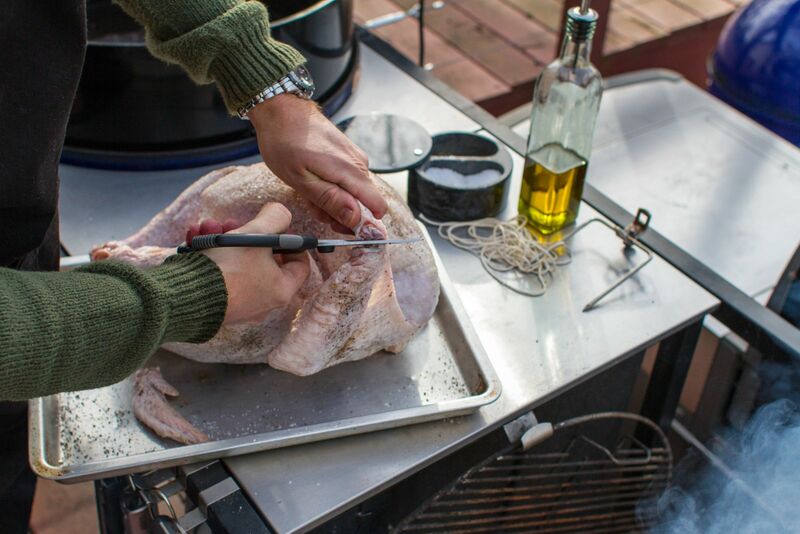 Push the forks together before tightening the set screws, so that the turkey is compact and secured. Place the spit on the grill. 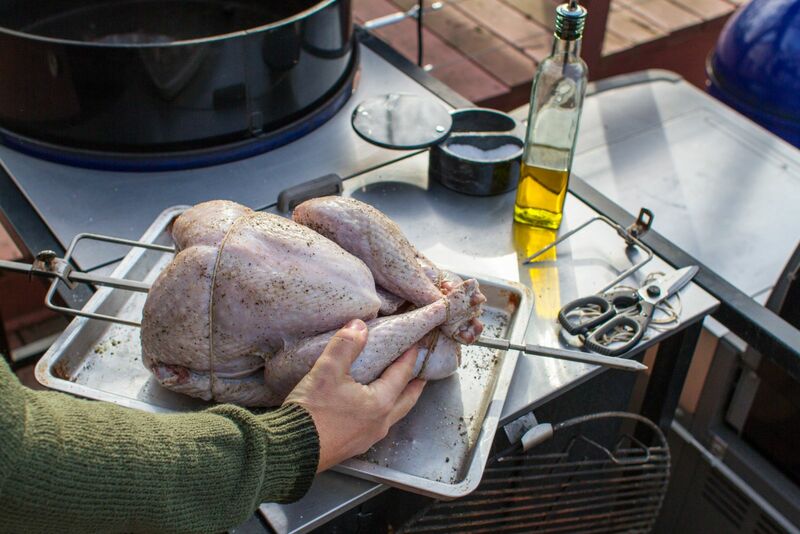 If grilling with the rotisserie ring, be sure to set the counterweight to the side opposite of the breast meat. This helps balance out the turkey and reduces stress on the rotisserie motor. 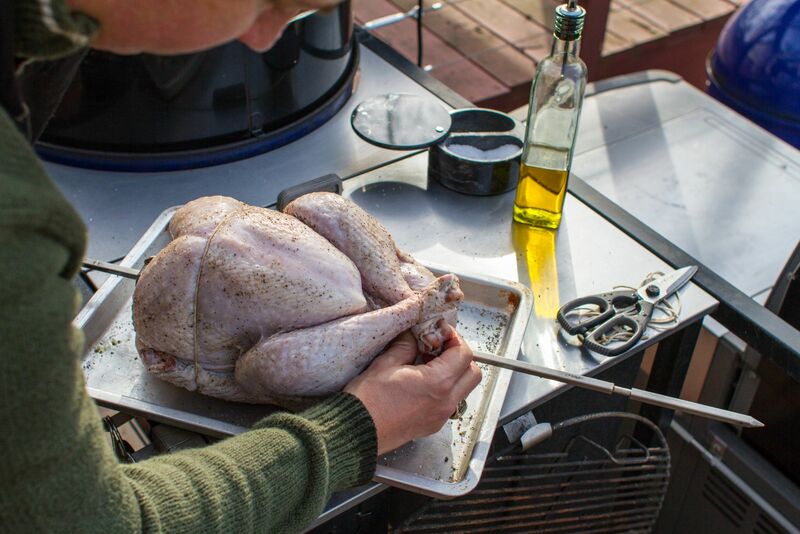 For a 14 pound turkey, figure about 2 to 2 ¼ hours of grilling, when the deepest part of the thigh reads 170 F with an instant read thermometer or iGrill to easily monitor your turkey's temperature.